Designed for dry yeast activation up to 2kg yeast per batch. The container of the Yeast-Booster PRO is 110lt large allowing sufficient head-space for foam. A single tube serves for pumping must in and out of the container, as well as pumping yeast mixture into the target tank and also cleansing at the end of the process. The oxygenation takes place during the pumping-in, serving to enrich the medium. The stainless-steel cover and the integrated filter effectively contribute to reduce contamination by wild yeast from the cellar environment. 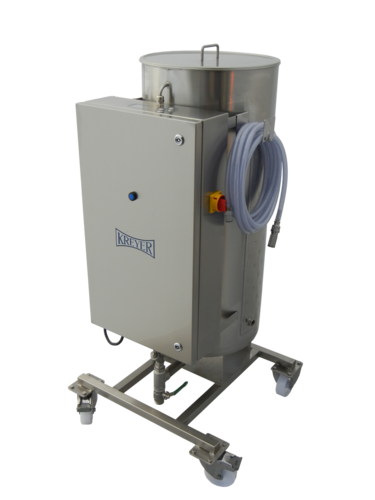 Complete encasing in stainless steel serves for easy cleaning and hygienic operation. Equipped with wheels, the unit can be easily mobilised. The Yeast-Booster is a compact, mobile unit for reactivation, propagation and optimal revitalization of yeast cells for fermentation. Nutrition management, adding of oxygen and the correct temperature are required to achieve an optimal process. All of these are available in the Yeast-Booster PRO.